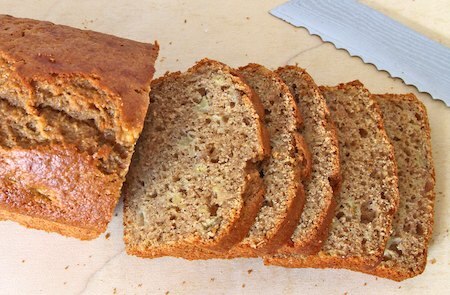 I came up with this sourdough quick bread by heavily tweaking one of my favorite “regular” banana bread recipes. Why the adaptation? 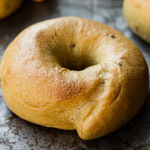 It could be that I believe that my changes — incorporating a hefty amount of sourdough starter, significantly reducing the amount of sweetener and fat, and replacing the butter with olive oil — transform what is essentially cake into something falling somewhere between turnip greens and quinoa on the healthy food scale. 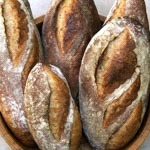 Or it could be that sourdough just makes everything better, and that’s reason enough. The idea in adaptations like this is to substitute all or a portion of the flour in the original recipe with the flour in the sourdough starter. 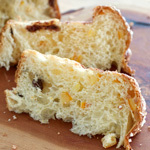 But one challenge in adapting pastry recipes is that the starter must be fairly liquid (around 100% or more hydration) in order to incorporate easily with the other ingredients without having to work it very much, which would produce gluten development that is generally undesirable in pastries. How can you bring all that water along without making the batter too wet? If the original recipe calls for water as an ingredient, the amount can be reduced to account for the water in the starter. Otherwise, it’s a little tricker. If there are other liquids, such as milk or egg whites, you might substitute a powdered form of that ingredient, such as milk powder, and let the starter water stand in for the liquid component of the ingredient. Reducing the amount of sweetener can also help make a batter less “wet” (as well as, of course, less sweet, which I generally find to be a good thing). It’s pretty much a trial-and-error process (or at least it is for me), so I won’t be able to give you hard and fast substitution formulas for other recipes. By the way, the recipe I started with is the banana bread from Mollie Katzen’s classic Moosewood Cookbook, but this version is really nothing like that one. 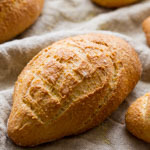 If you love that bread and want a variation that more closely approximates it, do this: Replace the olive oil with an equal weight of melted butter. Replace the lemon zest with the zest of one orange. Replace the ginger with 1/2 teaspoon (1.2 g) of nutmeg. 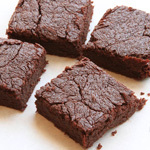 Add one tablespoon (4 g) espresso powder and 1/2 teaspoon (2.8 g) almond extract. Generously butter two 8.5 x 4.5-inch metal loaf pans. In the bowl of a stand mixer with the paddle attachment, beat the oil with the sugar or honey until smooth. Add the vanilla and the lemon zest, and continue to beat on medium-high speed until the mixture lightens in color. Add the sourdough starter and mix on low speed until it is almost fully incorporated. A few streaks are okay. Sift the whole wheat flour with the salt, baking powder, baking soda, cinnamon, and ginger. Add the sifted dry ingredients to the batter alternately with the banana and nectarine, beginning and ending with dry ingredients and mixing gently to combine after each addition. Bake at 350F for about 1 hour, until a tester in the center of the loaf comes out clean. This sounds yummy. I have played with injera (teff starter- which is essentially a sour dough starter), as sometimes we just don’t eat that much injera and I don’t like to let it go to waste. I like the olive oil idea (especially since I have one who is allergic to dairy). I wonder if there is a powdered non-dairy milk-wannabe out there. I usually use coconut milk or almond milk to replace the dairy…but you are right in that the sour dough starter is wet and could throw off a recipe if you are not careful to adjust. This is totally brilliant! I can’t wait to try it out! Looks moist I would definately try. My son love bananas! This is great! Just what I was looking for! thanks! Ahhhhhmazing. 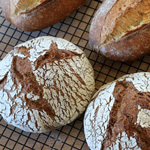 Thanks for the interesting tips on adapting non-sourdough baked goods to use starter. I wouldn’t know where to start! You did all the trials on this one, though, and it sounds fantastic! I cannot wait to make this! Such a lovely looking loaf! I’d really like to try it, but ridiculous as it sounds, my family doesn’t like anything with banana. 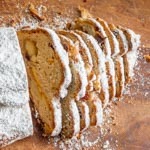 the ideal recipe if you ‘ve plenty of sourdough (for istance when you’re making a 3days scheduled sourdough panettone) and/or want make your kids take to school a good source of energy…I’l try it! I love adaptations. especially if they involve sourdough. I think I am going to drive myself crazy with these type of adaptations in the near future. do you think it would be actually possible to do a banana bread without baking soda/powder? Thanks for this wonderful recipe. I love Banana breads/Muffins. Love that it uses sourdough. I made it yesterday and it was awesome. Thanks again, Susan. I was going to make the below version but I think I will make this instead. 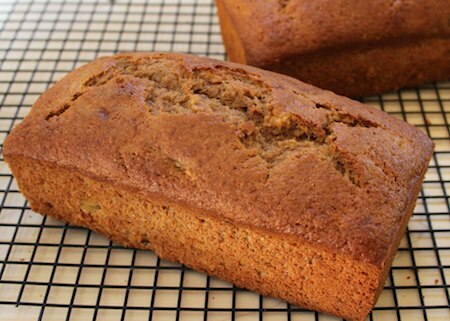 This is a refreshing and delicious banana bread! My family loves banana bread so we’ve been trying different recipes and this is definately one of the best. I substituted agave for the honey, all bananas for the nectarine and orange rind for the lemon because of what I had on hand and it turned out wonderful. It’s the perfect balance of sweet banana flavor with an after hint of orange and very slight sourdough flavor. You still feel like you are eating banana bread but not getting loaded down with fat and that too sugary flavor. 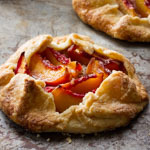 I am looking forward to making the recipe with the lemon and nectarine as well. I was wondering if applesauce could be used in place of the olive oil or if that would disrupt the liquid ratio? This recipe is a “keeper”! I used organic Tournesol honey, Jamaican Allspice (1/2 teaspoon substituting for 1 teaspoon of ground ginger that I lacked), and grated Pink Lady apple to fill out the banana (hadn’t enough, nor did I have nectarines) and I added some chopped walnuts. I also elected to bake muffins (18) and a small loaf. I liked the texture from the apples and walnuts, but missed that little bit of extra banana. Next time, I might reduce the cinnamon. All together they were very moist and delicious! Would love to make this, but don’t know how the convert the big measurements to cups.Can someone translate for me please? look up http://www.metric-conversions.org for metric-to-American measurements. Perfect. Very Tasty! Thank you for a wonderfully recipe. I had no eggs on hand, but used Egg Replacer instead, same about the brown sugar, just used raw sugar. 4 bananas. I had been ignoring my starter for 1.5 days so I added one envelope of instant yeast for a good measure :). I also really like the fact that, I can use up a lot of starter in one recipe. This recipe looks so good! I would like to try it. Could someone please help convert all the measurements into standard American ones? Specifically – how much sourdough starter is required for this recipe in cups? Thank you all. I tried this and it really didn’t end well… it was a fairly loose batter consistency which was nowhere near cooked by the end of an hour in the oven. Even after nearly 1.5 hours the skewer was clean when I pulled it out but the breads collapsed as flat as a pancake as soon as they cooled a little. Can’t really understand how they can turn out the same with honey (which I made mine with), which would add a lot of extra moisture, and sugar, which would make a much drier batter. wondering if you could give the ingredients in spoons and cups, too. As usual with all your recipes, turned out fantastic. I loved the addition of lemon zest. I used the extra banana instead of the nectarine. I also added some unsweetened dessicated coconut. Super fantastic.